Bought a fake? Don't resell! or else) as a forger. 1. NEVER, ever buy from a seller whose feedback is hidden. 2. HIGH POSITIVE feedback alone is no proof of honesty. Forgers know how to get loads of positive feedbacks without actual sales. 3. ASK for detailed pictures. Compare capsules and caps as well as shapes of bottles and colours of glass with pictures of genuine items. 4. BEWARE of Italian items that are only available to weird countries (such as Singapore - sorry guys). 5. 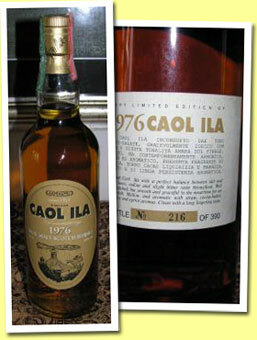 BEWARE of old labels that are exceptionally clean. 6. BEWARE of coloured (painted) twist caps that are exceptionally shiny. 7. 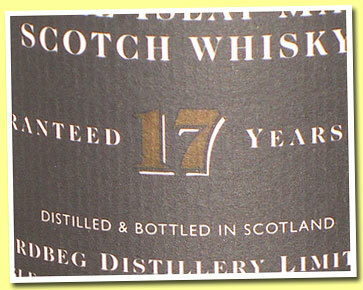 LOOK for traces of glue around labels and neck labels. 8. VERY RARE, never seen before versions for cheap simply DO NOT EXIST. Be sure that if you found one (by chance - or so you think), experienced collectors will have seen it as well. Check the counters! 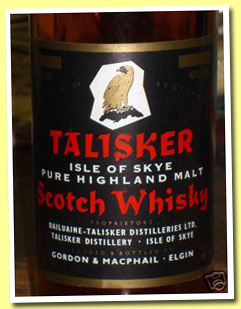 IMPORTANT - Whisky Collectors, you should all read this piece that was published in PlanetEarth online. 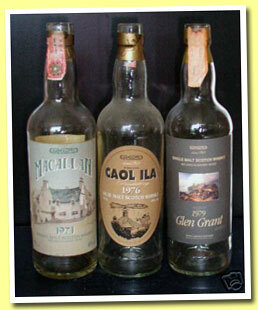 You'll find out that the majority of old whiskies that have been tested using carbon dating have been proven fakes! The list of 'dangerous nicknames' on eBay has been updated. Please check at the top, left of this page. WARNING - There are many Italian fakes on eBay again! We won't restart the 'fake' page (much too painful) but this is really too much. 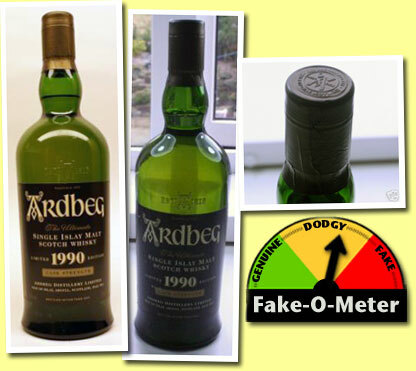 Our friend Geert, who's a well-known Ardbeg collector, tells us for instance that 'gioveg' just sold a fake Ardbeg 10 years 75cl green bottle. - The real bottle has a small dot on the neck. 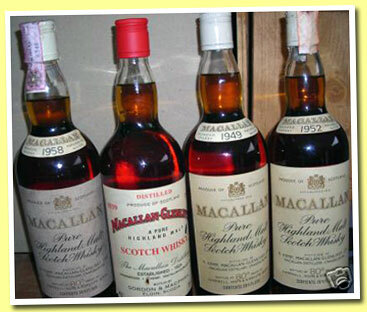 The same seller sold also a fake Macallan Royal Marriage (wrong bottle) and maybe others. And there are several other ‘nicknames’ that currently sell fakes! - NEVER, ever buy from a seller whose feedback is hidden. - ASK for detailed pictures. Compare foils and caps as well as shapes of bottles and colours of glass with pictures of genuine items. - 100% positive feedbacks, or other items from the same seller that look 100 genuine (usually cheap old liqueurs) are no proof of honesty. Dear all, here’s where we are. 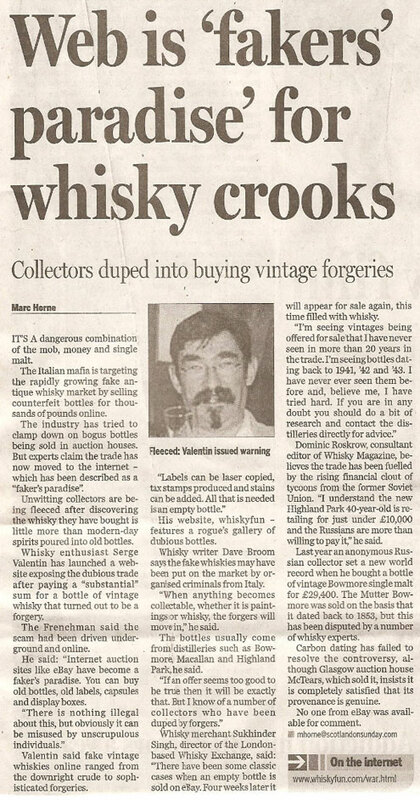 After having posted dozens of examples of either plain fake or dodgy bottles (we’ve got many more, alas), we hope that the friendly whisky community is now aware of what’s happening, and will be a little more cautious from now on when spotting ‘the bargain of the century’ on eBay or elsewhere. 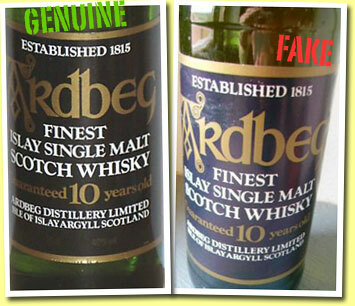 What’s more, it seems that there are less of these fakes for sale these days, and that some suspect sellers switched to selling genuine bottles for now. Excellent move, we hope it’ll last. Anyway, we’ve already slowed down and we’ve now decided to stop posting such examples, as we wouldn’t like to make people more paranoid than needed - and because we'd hate to cause too much collateral damage. It’s certainly not our role to battle fakes forever! We’ve met or talked with several distillers and bottlers, and some of them have promised that they’ll improve the ways they can help the buyers avoiding fake or dodgy bottles. We’re currently working with them on this and of course shall post about the outcomes on this page. Comments: we've checked roughly 20 different bottles of this 1990, both for Japan and Europe, and all had golden/bronze capsules like the one on the left. Which means that this item on the right, that bears a black capsule (wrinkled, at that, but that may happen), is either a relabeled 'cheaper' version, or a refill on which someone has put back a capsule that was not the original one. Very dodgy, at best. February 23 update: A FRIEND JUST REPORTED THAT HE OWNED TWO GENUINE BOTTLES OF THIS BEARING BLACK CAPSULES. These bottles were bought directly at the distillery.So, even if if all bottles we've seen had golden/bronze capsules, this example can't be classified as 'dodgy' anymore. 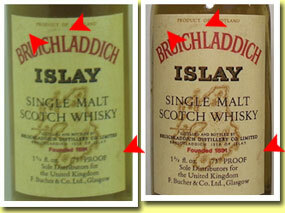 It's not impossible that a few bottles were mistakenly 'capsuled' with black, and then sold at the distillery indeed. Good news, innit! Comments: same picture used for all these items. 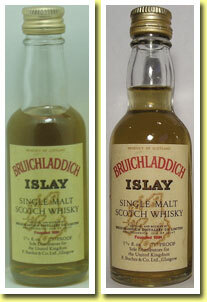 Whisky is probably too pale (the 30yo was very dark whisky). No boxes (seller says he/she bought the bottles in Italy and wanted to make room in luggage). 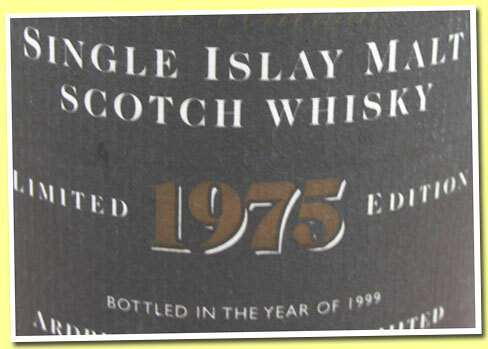 And, most importantly, no lot number whatsoever on back of front label (confirmed by a buyer). Every genuine bottle should have this number. 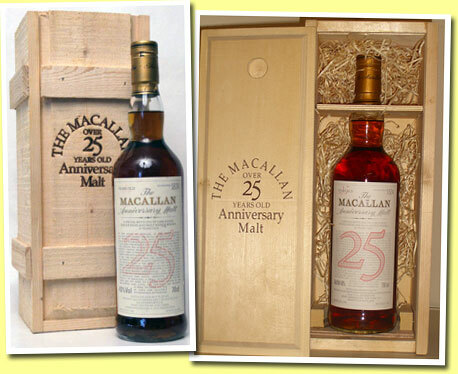 We think that you should never buy one of these Macallans at auctions, especially when they don't come with their original boxes. Now, the seller has many genuine items, so maybe he/she is not aware of te fact that these ones are dodgy. 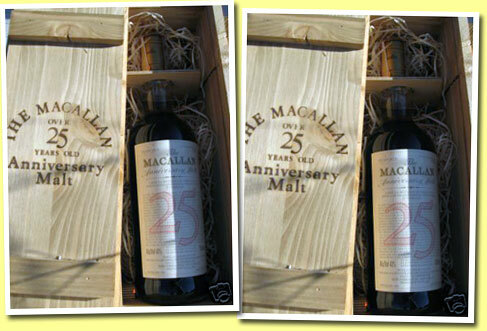 'THIS BOTTLES AUTHENTICITY IS IN QUESTION - PLEASE BID AT YOUR OWN RISK - THERE WILL BE NO REFUNDS - THIS IS A FINAL SALE. YOU ARE ADVISED TO ASK ANY QUESTIONS BEFORE BIDDING! Well, we think he should have withdrawn the item! But this also reminded me of two other dodgy examples that a good friend had sent to me a few days ago. These bottles had been sold to him privately by a big Italian eBay seller whose nickname we won't disclose just now because we never saw other obvious fakes from him. Yes, same make, obviously. What's even funnier (so to speak) is that our friend gathered a few co-tasters and decided to try these head-to-head with a regular 10yo. Guess what, they were unable to make any differences. No need to say that all these are plain fakes! Update - a knowledgeable frend of ours tells us that he's got at least one such bottle in his collection and that he's 100% sure it's genuine. We trust him, so let's say this is most probably genuine instead of dodgy. We've got many more examples of fakes and shall post a few of them in the near future. If you contacted us recently, and are awaiting an answer, please be patient, thank you. In the meantime, we're meeting with distillers and trying to make them organise the way they could help the buyers avoiding fakes a little better. More on this later! As far as we know, the 1980 ‘Kildalton’ always came with a golden/bronze capsule (left) and not the usual dark green/black one (right, item that was sold). However this could well be a lighting issue and the tax strip hides most of it on the picture anyway. 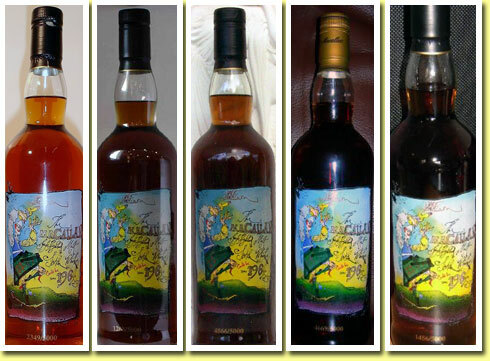 What’s sure is that this goes to show how important it is to ask for detailed pictures whenever a bottle looks a bit suspicious after you’ve compared it with pictures of authentic bottles that you can find on various websites (collectors, retailers, auction houses etc.) 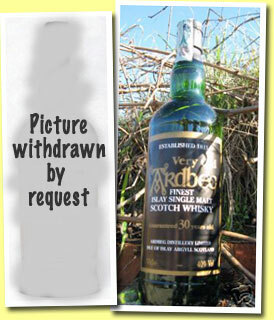 Anyway, only the buyer of the bottle could now tell us if he got a bottle bearing a golden/bronze cap or a dark green/black one – in that case it may well be a refill or a ‘simpler’ Ardbeg on which somebody stuck a genuine label. Now, look a little closer... Yes, amazingly the stains on both labels are exactly the same. These two minis were sold by the same seller (usually a serious seller, so he's probably been swindled himself) to two collectors who happen to be friends, that's how they found out about this. Right, what do we notice? Usually, bidders who really want to win an auction will go above a psychological price point, and not right below it. In other words, if you want to sell, say a bottle of whisky, you’ll put it a EUR 99.90 rather than at EUR 100.10, but if you’re a bidder at an auction you’ll indeed put your bid at 100.10 (or 103, 107, whatever), thus trying to ‘kill’ competition. So, what do we notice here? Some anonymous bidders have put strange bids, typically sellers’ bids. Check the red arrows we added to the picture, is that fishing or what? And then, a few minutes before the auction’s closing time, somebody (probably a true buyer) spotted this amazing bargain: four old and rare Macs for EUR 699! 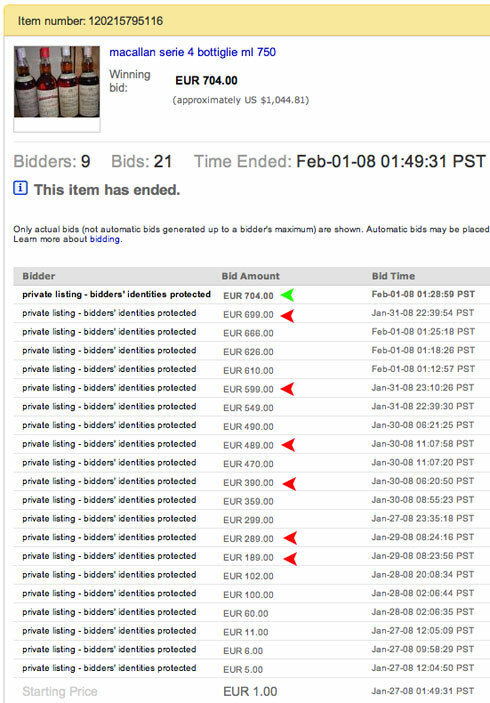 So he put a max bid at, say 717 – pure conjecture – and won the auction. Of course, this is no proof of anything, and all bids may well have been ‘genuine’, but all this is a bit dodgy, isn’t it! As for the number of bidders (9), this doesn’t mean anything because dodgy sellers use multiple nicknames as we all know. Anyway, again, it’s always better to check an auction’s history before you put a bid. That's right, three empty bottles without caps (manca il tappo) were sold for EUR 50 to our friend portokalo2023, including this empty Coal Ila bearing exactly the same number, 216 of 390! Comments: we don't have the pictures of the original sale (they expired from google's cache) but except if this is a misprint, that is to say if two or more bottles were bearing the same numbers at time of bottling, which we doubt of course, this a a refill made by Portokalo2023 (no longer a member of eBay). 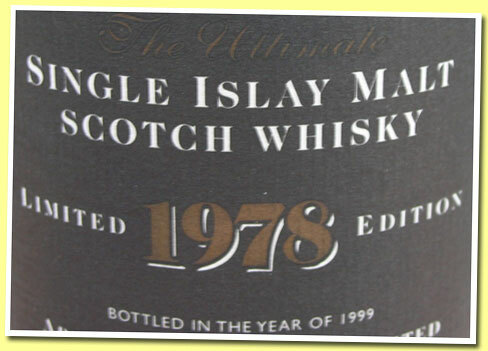 The current seller of this bottle could well have been swindled himself, as his records and reputation are rather good. Of course he's got every rights to post his comments here, should he send them to us. 16:15 update : and here's the picture of the empty bottle(s) as it was sold on September 7.! Thanks to a very dedicated 'anti-fake warrior'. Other update: the seller of the (probably) refilled bottle just confirmed that he had bought it from the guy who had bought the empty (portokalo2023).As expected, it seems that he's been swindled indeed. More later. 18:40 update : the seller cancelled the auction. He wasn't aware of the fact that this was a refill and was rather the victim here. Thank you, case closed. 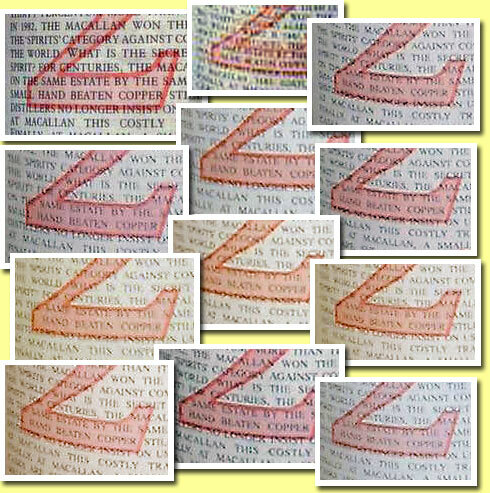 MORE ON DODGY CAPUSLES (tin foils). When spotting an awful looking capsule (large wrinkles, looseness etc.) it’s not very easy to come to conclusions. Was the bottle fondled? Was the capsule put back by hand after a refill? Or is it plain normal? The first thing to do is to check on retailers or collectors’ websites if other similar bottles display the same kind of problem. It can’t be very normal, as not all bottlers have/had state of the art bottling equipment. 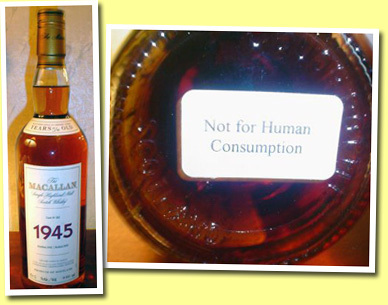 If they don’t, it may well still be ‘normal’, because we all know that whisky expands when exposed to higher temperatures. That may push the cork and the foil that’s over it out of the bottle a bit, and usually its owner would then try to put it back in place, causing these ‘wrinkles’ or ‘crimping’ to appear on the capsule. Such bottles should command lower prices at auctions, even when probably plain genuine, but please first check if not all known bottles display the same kind of 'problems'. 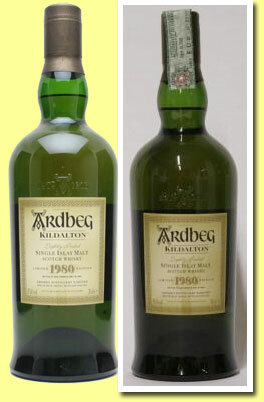 At the left, an Ardbeg Very Young 'For Discussion' that, we believe, was only available at, or from the distillery. Yet, this bottle carries an Italian tax strip. At the right, an Ardbeg Very Old 30yo, that was bottled in the 1990's but that carries the 'new' design of the Italian UTIF tax strip, the latter having replaced the older design in 2005. So, does that make these two bottles 'dodgy'? Well, what's sure is that any potential buyer may ask the seller why his bottle carries such an unlikely tax strip, because the strip might simply have been applied to reassure the buyer that the bottle was originally sealed (whilst in reality it was opened and closed again). But it's in no way proof that the bottle is dodgy. 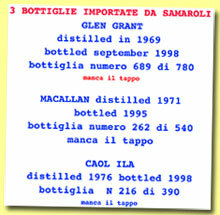 Indeed, it can happen that a profesional reseller, who bought bottles in the open market (while intending to resell them or not), has to put these tax strips at a certain point even if the bottle wasn't previously imported by, well, the official importer, because the Italian Guardia Finanza (or another governmental body) asked him to do so. In that case, the tax strips will simply be brand new ones. That happened, for instance, to a famous Italian collector and retailer, who had to put new tax strips on thousands of old bottles that he had previously accumulated. In any case, it's always better to ask the seller about all that before bidding. Problem: same stock as before... and pictures! Comments: please check our January 25 entry, these bottles have the same problem when zooming in. What's interesting is that several new Italian sellers appeared right on January 25, including this one who goes straight onto our blacklist. What's more, he didn't even bother with putting different pictures of the 1958 (picture, left) and 1962 (picture, right)! Comments: the seller has every right to sell this dummy (there's only coloured water in the bottle) I guess, but it's amazing that it's already at US $225.00. What's more, he's announcing that he'll also list a 1952, 1965 and 1971 in the future. Let's just hope that dirtier hands won't be reselling it as genuine in the future (but there are clues on the labels, so be sure we'll be vigilant). Comments: Several pieces of evidence that this bottle is very dodgy. First, the seller notoriously sells fakes made in Italy. Second, all detailed pictures just won’t be displayed on the page (something to hide?) and third, the label looks extraordinarily new. Even such old bottles that have been protected by their boxes don’t look that new, especially since both large black and gold printings are rather fragile. No plain evidence that this is a fake just from the picture, but we think it’s dodgy at best. ... And many other examples (is that modern art or what!). We never saw one single label where the outline was clearly between the two lines, except on these suspicious 'brand new ones' for Rémy Amérique on eBay and elsewhere. Is that enough for us to state that these 'Rémys' are fakes for sure? Probably not, but the 'pedigree' of some of their sellers, the fact tat they are in pristine conditions, and their current abundance in the second hand market (like the Gran Reservas, or the 30yo bue label etc.) sure make them dodgy. in any email, forum or website of any sorts!